A revamped economy is fueling a recent surge in wages, new homes and America’s migration habits. The pendulum of homeowners on the move, stagnant throughout most of the decade, is gradually swinging upwards. New Mover Marketing firm Our Town America, the nation’s first and fastest growing new mover marketing franchise, is happily connecting residents to the local businesses that are the lifeblood of their new communities. As people move and adjust to their new city, Our Town America discovered that fitness centers are playing a major role in uniting new residents with friendly faces. The full gamut of fitness centers – ranging from national gym chains to CrossFit centers – are capitalizing on the uptick in moving. Our Town America is the perfect platform and partner for fitness centers looking to get a jump on new residents, and ultimately, new clients. They offer a strategic model that provides New Mover Marketing solutions through direct mail for local businesses eager to welcome new residents to the neighborhood. This includes gyms and fitness centers trying to replace members that have moved away with the people that moved into their homes. Each month, Our Town America helps gyms and fitness centers reach thousands of new movers across the country settling into their new neighborhoods. Those residents are sent warm, personalized offers from gyms and fitness centers in a customized Welcome Package that allows owners and managers to track and monitor their return on investment. 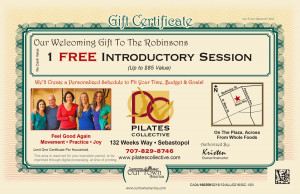 Kristen Iuppenlatz – Pilates Collective in Sebastopol, CA: “Our Town America is the most effective local marketing program I’ve used in my eleven years in business because it generates long-term customers,” says Kristen Iuppenlatz, owner of Pilates Collective in Sebastopol, CA. Iuppenlatz has been offering a free introductory session (up to $85 value) to an average of more than 130 new movers each month since January. In fact, she says Our Town America introduced her to more than a dozen new movers within the first year who signed up for a five-session introductory offer and became loyal customers. 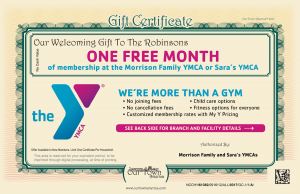 Brian Vest – YMCA in Charlotte, NC: “Our Town America is the most intentional and impactful marketing we’ve ever done at the YMCA,” says Brian Vest, Associate Executive Director at the Morrison Family YMCA in Charlotte. Vest offers one free month of membership. “Hundreds of new movers are finding the YMCA on purpose now, not by accident. Our Town America is a strong partner for fitness centers across the country. 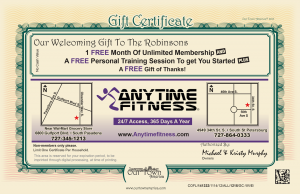 Contact Our Town today to “work out” a deal that will help you replace those who’ve moved away with new, loyal members!